It is the RHS Rhododendron Camellia and Magnolia Group Centenary Celebration next weekend,7th/8th May at Wisley. On Saturday the Telegraph had an article on the centenary 'Rhododendrons return to the fold' which said I quote 'Some of the most famous rhododendron gardens will be exhibiting: Caerhays, Exbury, High Beeches and Savill Gardens'. The article is about the Centenary Celebration when many of the famous Rhododendron gardens will be showcasing rhododendrons including the top 100 as voted for by members. High Beeches will be exhibiting several Rhodododenrons including Rh. Florida Ogada a hybrid between Rh. sino grande and macabeanum, Rh. niveum and Rh. falconeri. 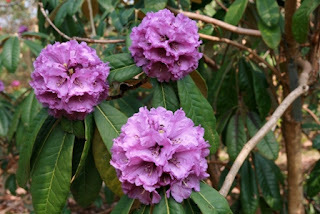 The competition will be tough and there are few classes but it is a chance to see some of the best Rhododendrons in the country exhibited by some of the greatest gardens in the country.